This is the latest version of the classic MSR Hubba Hubba. The NX (Next Generation) uses lighter materials with a weight of just 1795g, which becomes even more remarkable when you consider it has a huge porch and entrance on each side. It pitches inner-first, so the inner may get wet if pitched in the rain, with a skeleton of poles forming a frame from which the inner is suspended. The fly fits over the top and neat ladder-lock adjusters on narrow webbing help to tension the structure, which is very stable once erected. The flysheet doesn’t reach the ground, so in really wet and windy conditions the weather may drive under the edges of the flysheet, but the living space is outstanding with plenty of room in each porch and superb headroom throughout. The outer doors have twin zip pulls so they can be opened from the top or bottom, while the inner has mesh on the top areas, which is great for airflow but chillier in cooler or windier weather. Pitch the MSR Hubba Hubba NX in the dry and sleep in it in warm, calm conditions and it’s outstanding; but in cold, wet and windy weather other tents do have advantages – all except in terms of price, weight and living space. 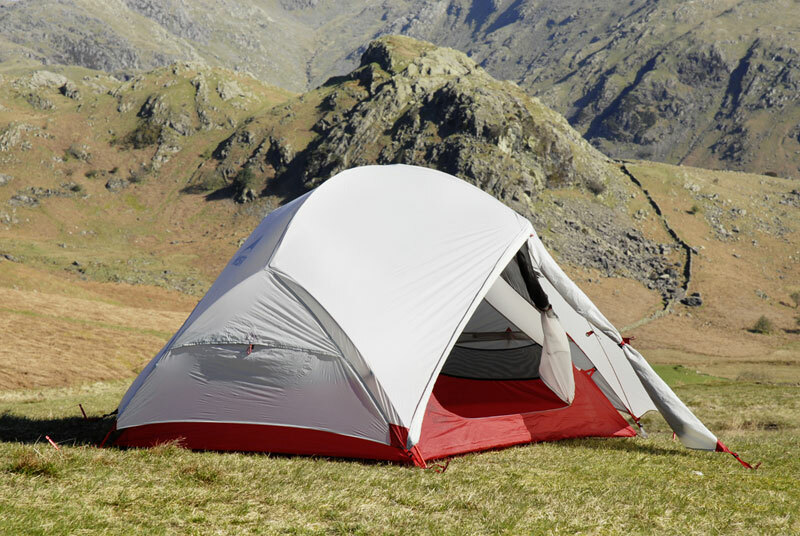 The MSR Hubba Hubba NX’s price, weight and space are superb for two, with the slight niggle being that other tents are better for cold, wet and windier conditions.